As we drive around Cape Coral I am surprised to see us go to a housing and residential area near the library. 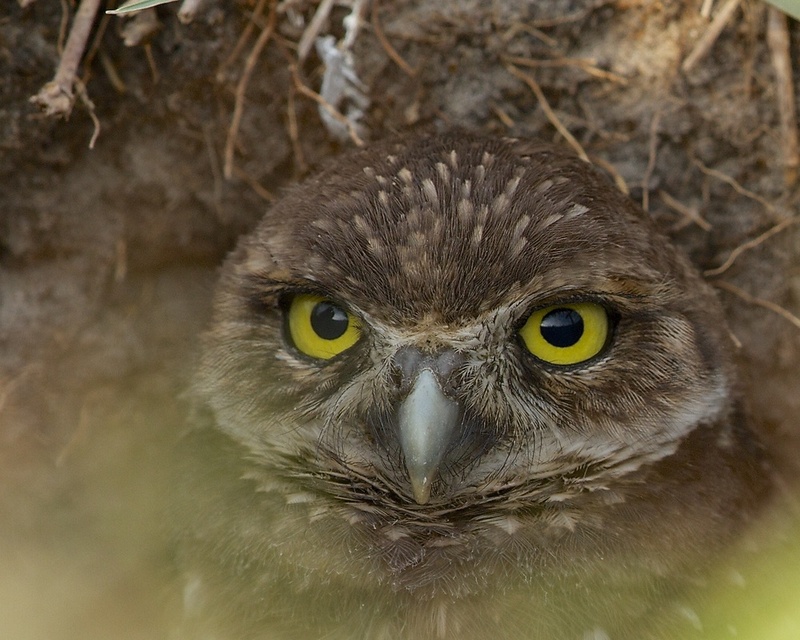 There are many vacant building lots in the area where the owls have found a new habitat for homes. I guess they heard about the housing bust and figured the low rates made a perfect time to buy in the area. Most of the nests are marked off with stakes and tape and there is usually a cross-shaped perch or stick posted near the nest. 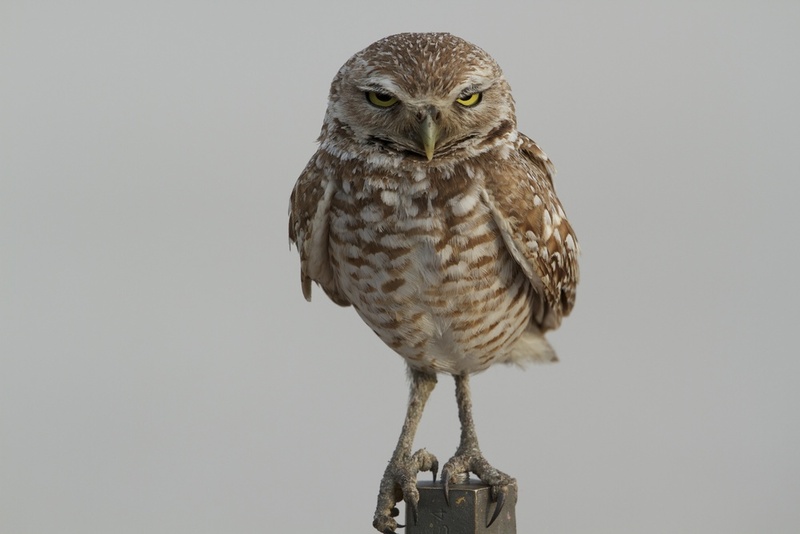 It protects the nest from lawn mowers and allows the owls a perch from which to guard against predators. 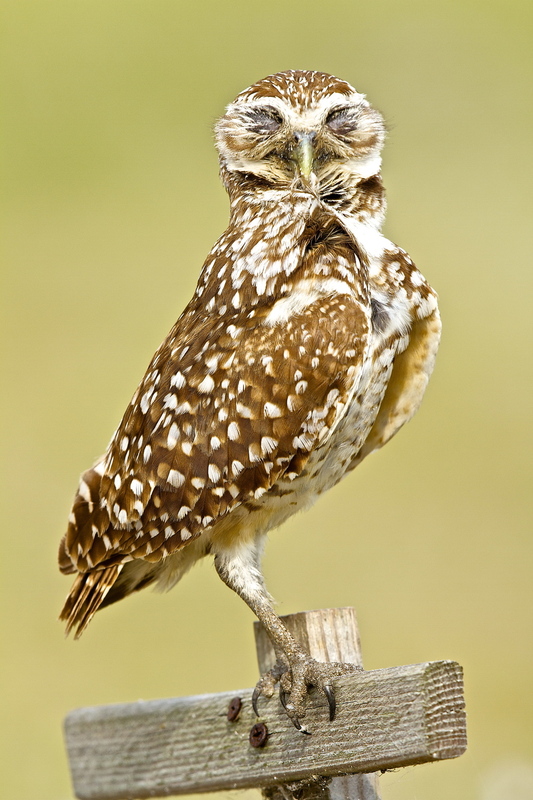 The owls dig deep holes into the sandy soil or take advantage of existing homes of tortoises or armadillos. We see several families and one had six fledglings in it. 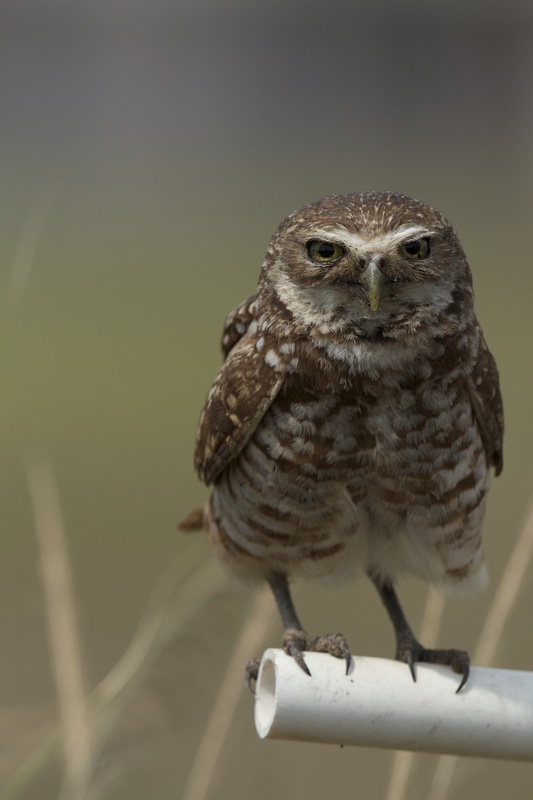 The owls are used to close human proximity and allow you to get very close to the nests. If they are agitated they let you know by a hiss or head bob movement. One nest was in a local residents home in the front yard by the sidewalk. She became more agitated than the owls and let us know by her scary stare (and ugly house robe) that it was time to move on so we quickly left to respect their wishes. We go to the “library” area where several large open lots are home to about a dozen or more owl families. It is not uncommon to find several nests in close proximity. It is warm and sunny when we started in the early afternoon but the clouds began to build up and skies darkened a bit by the time we left. We still were able to have some excellent lighting conditions and I got some treasured photos. I won’t soon forget peering into the burrows and seeing those large yellow eyes staring up at me. 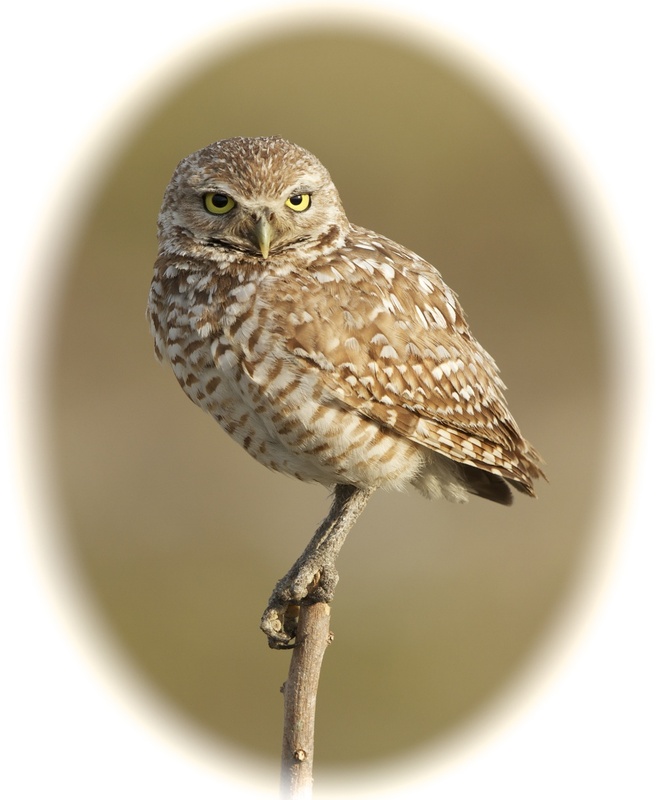 I hope you enjoy these first photos I have of these marvelous little owls. Each one appeared to have a unique personality all their own. Just like us taller humans do. If I act nonchalant perhaps they will go away. Oh my goodness. I am so sorry I didn't notice you standing there with that stupid camera! if I stand on one leg will you go away...Pleeeaseee! Do these eyes look antique to you? If I close my eyes and wish hard enough maybe they will go away. Can't a bird do her feathers in peace! Who invited you? 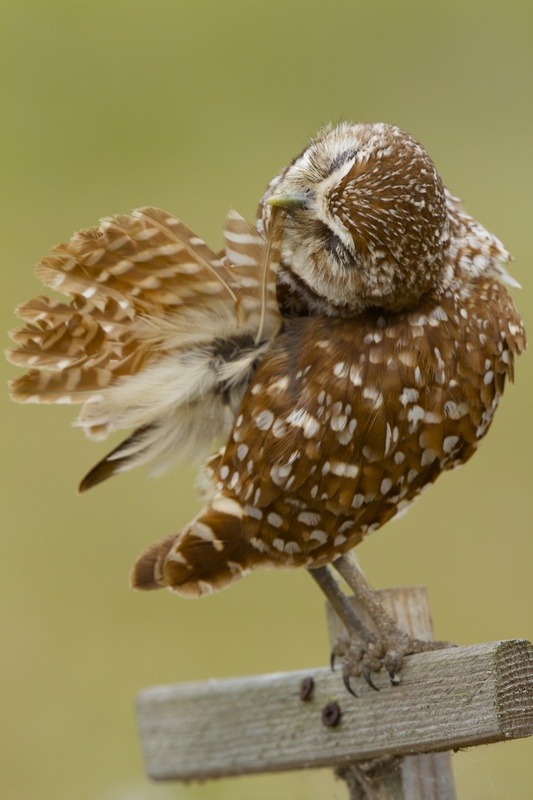 A young fledgling owls strains its neck to get a better view of us. Psst..tell the old lady in the house to scare them away..
Will you get that thing outta my face buddy? Who invited you in here? Hey buddy, see these claws..I can pluck your eyes out real quick ya know. Oh don't mind him, do come back..really, we are so..
so excited to see you...zzzzz!